Are self-checkouts only relevant during stores peak hours or can they actually replace traditional checkouts on a full-time basis? The efficiency of self-checkouts does not only reduce lines. It can also – when used to its full potential – provide a better and more conscious customer experience. It’s a common belief that the benefits of self-checkouts are limited to preventing lines during the store’s most hectic hours. But why should this kind of efficiency be restricted to a certain time of the day? Self-checkouts are actually optimal for increasing the efficiency during the store’s less busy hours as well. By requiring fewer cashiers they make it possible for staff to improve the customer experience by focusing on other areas in the store. They can be showing customers where to find items, stocking up the shelves in time for peak hours and so on. It gives the staff more time to connect with the customers and provide a better, more attentive shopping experience. Furthermore, by using self-checkouts to their full capacity, and during all opening hours, the investment will pay off faster for the retailer. Learn more about the implementation of self-checkouts in “How to implement self-checkouts right”. It´s well known that customers dislike standing in line. Ten minutes of restless waiting during the store’s rush hours can ruin a good shopping experience for the most patient of people. The real challenges lie in those moments of unplanned traffic, for example when a school class, busload or football team enter the store unexpectedly. When this happens it usually causes chaos for traditional checkouts, two cashiers serving 20 plus customers just won’t cut it. Or the other extreme, where there are too many cashiers and they must idly wait for customers. The self-checkouts are quite a relief in moments like these, both for cashiers and customers. The staff doesn’t even need to call for backup, with a reasonable number of self-checkouts, one cashier is all you need. Another benefit with self-checkouts is that a customer can enter the store to buy a bag of chips and leave without having to stand in line. Isn’t it frustrating to wait in line behind customers with multiple grocery bags when all you want is to buy this one item? Most customer trips to the stores are for buying a small number of items. Even in large hypermarkets, 30-35% of customers are express customers. In supermarkets, express baskets can increase to up to 70% or more. For these it’s way more efficient to use a self-checkout and scan the item themselves than to stand in line and wait for the cashier to do it. In the worst-case scenarios, customers may even turn to the corner store for their late-night snack – just to escape the line in the grocery store. ● They can be used during all times of the day to reduce the staff’s workload. ● Fewer and shorter lines make the store less crowded and improve the shopping experience. This makes it more likely for customers to come back. ● They are excellent for unexpected rush hours since you only need one cashier to handle up to eight self-checkouts. ● They are beneficial for customers who want to buy fewer items without having to stand in the same line with large trolley shoppers. Self-checkouts can help with efficiency in many ways, but the question is – which one is most beneficial for you? All stores are different and might not experience the same benefits. Where do you lack efficiency and what can you can gain from self-checkouts? Interested in more detailed guidance on self-checkouts? 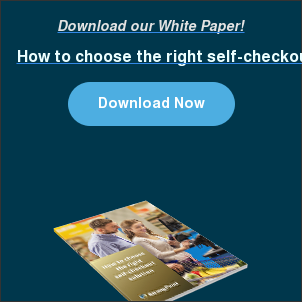 Download “How to choose the right self-checkout solution”.